Nico and Simoné Marais of Worcester brick welcomed 35 CBA members and guests to see his recently completed Habla Kiln in action. The energy-efficient Habla Zig-Zag Kiln (HZZK) is the first in South Africa. With its modest capital investment and small footprint, the HZZK reduces energy use, increases kiln profitability and improves cashflow by speeding up the production cycle. The logic of the Habla kiln design can be summed up in a single sentence, “move the fire, not the bricks”. By substantially reducing product handling, there are immediate savings in damages, waste, time and labour. The kiln is made up of a number of chambers approximately 6 metres wide, insulated within a semi-permanent temporary covering created using unfired bricks and sand. The Worcester Brick kiln is housed in an open sided, roofed structure that insulates and protects from the weather. The kiln is made up of a number of chambers approximately 6 metres wide, insulated within a semi-permanent temporary covering created using unfired bricks and sand. The Worcester Brick kiln is housed in an open sided, roofed structure that insulates and protects from the weather. Green bricks are packed inside the kiln’s chambers in a zig-zag fashion. The kiln’s fire is pulled through stationary green bricks using an induced draught created by a small 7.5KW bifurcated fan. As the firing zone moves around the kiln, fired bricks are unpacked from the “back”, while fresh green bricks are packed well ahead of the fire. The heat ahead of the firing zone pre-dries green bricks. This decreases reliance on open-air hacklines and streamlines the total production chain from over 30 days to as little as 7 days. The facility is no longer at risk from bad weather, making it particularly efficient in high rainfall coastal zones. Ignition is with coal nuts but within a few days, only internal coal fuel (added during clay preparation) is needed to keep the firing zone moving around the kiln continuously. The Worcester kiln has been running for 13 weeks without any additional external fuel being added. Because less fuel is consumed, black carbon and CO2 emissions are substantially reduced. The HZZK design is suitable for clay brick operations that want to replace clamp kilns without a huge capital investment. For larger operators needing additional capacity, more HZZK’s could be built alongside, or larger options are available. The HZZK is ideal for short runs of specials or high-quality product lines such as maxis or perforated bricks that need careful handling. The kilns can operate successfully without access to the national electrical grid, with the kilns fan and lighting using very little power, the option to run the entire system using solar is also available. 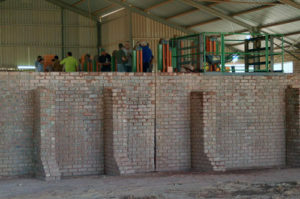 “We have found our Habla kiln to be very flexible in terms of our required brick output,” reports Nico Marais. “We control the speed of the kiln, rather than the kiln driving brick production. With a simple change in fan speed, we can slow down or speed up output. 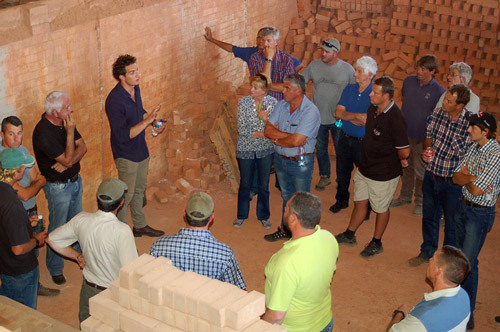 Note: The role of the CBA is to help members proactively reduce their emissions and improve productivity by exposing them to different brick-making technologies. The CBA does not endorse any specific methods – brick-makers should investigate and make decisions based on their knowledge and experience of their products, customer profile, locale, constraints and needs.